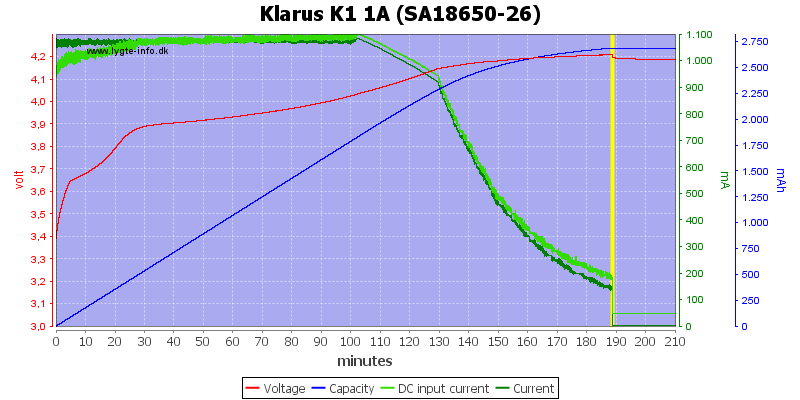 Klarus has lately made some chargers, this is a fairly small one that can handle 3 LiIon voltages and NiMH batteries with two different charge currents, this makes it a fairly universal charger. 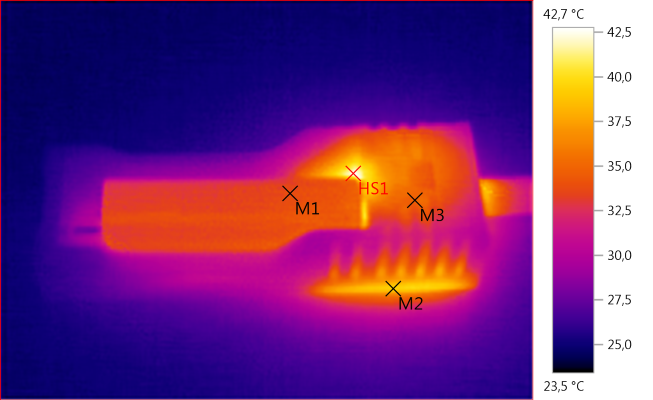 It arrived in a small cardboard box with specifications on it. 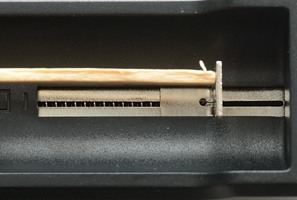 The box included the charger, a usb cable and the instruction sheet. 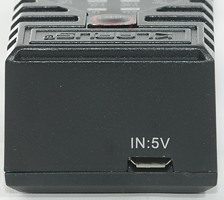 The charger has a micro usb input for power. 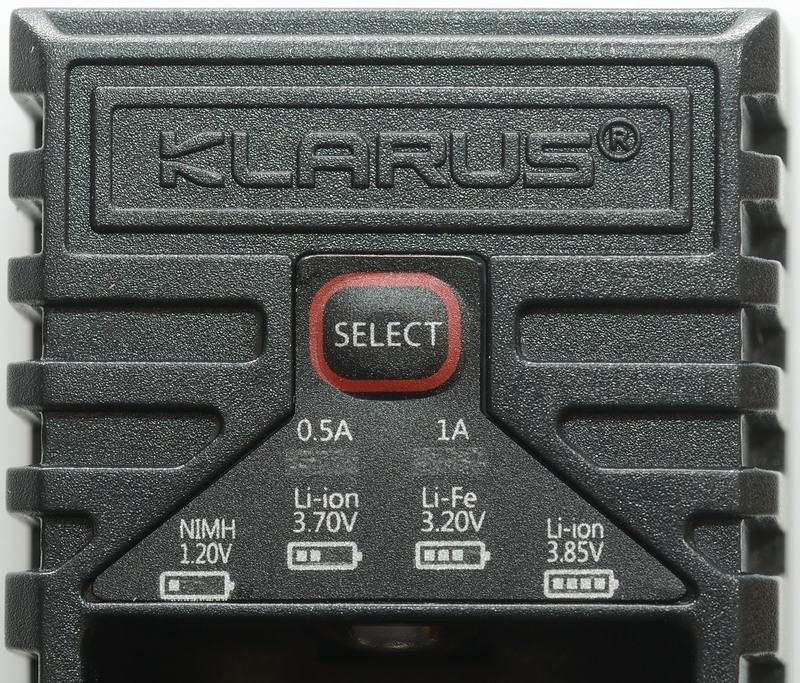 There is 4 blue leds, they are used to show charge state and when selecting battery type. 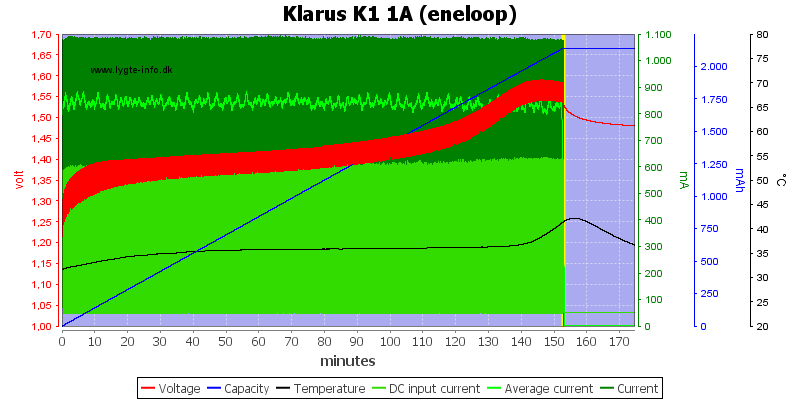 There is two red led to show selected charge current. 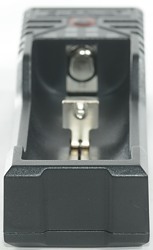 The slots can work from 32 mm to 73mm. 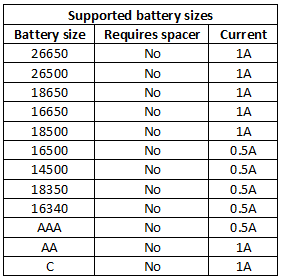 This means that it will handle even very long 18650/26650 batteries. 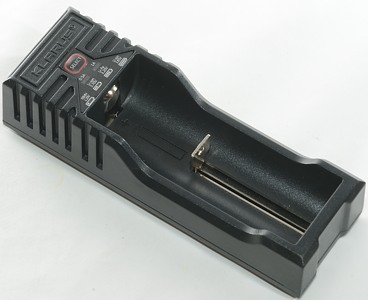 The charger can handle 73 mm long batteries including flat top cells. 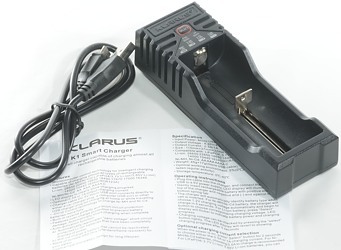 The charger uses a CC/CV charge profile with a termination current around 140mA. 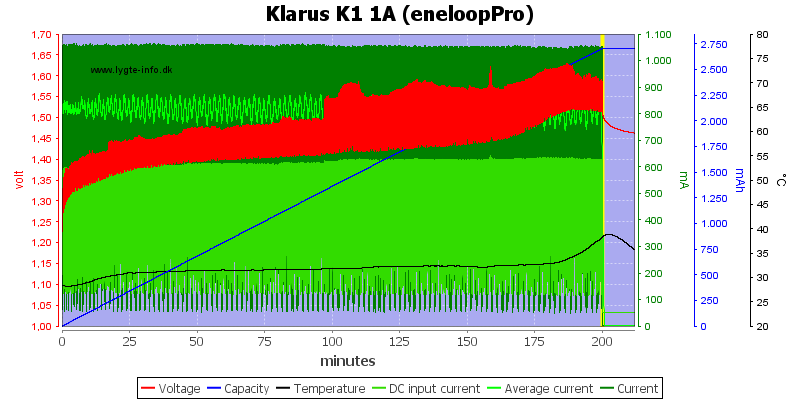 Other capacities uses slightly different charge times. 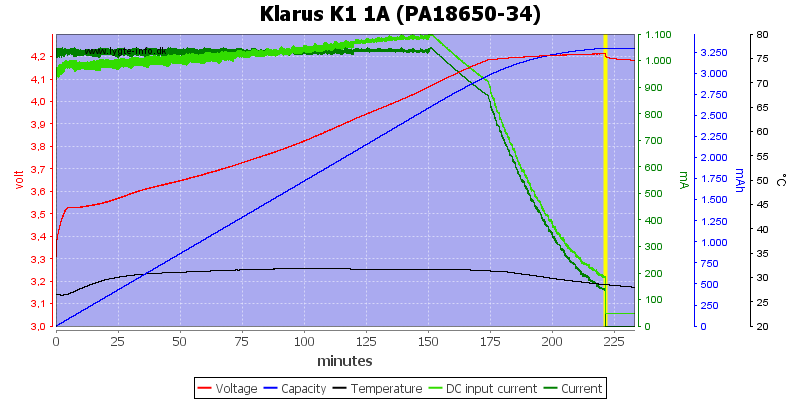 A old cell is charged nicely with CV most of the time. 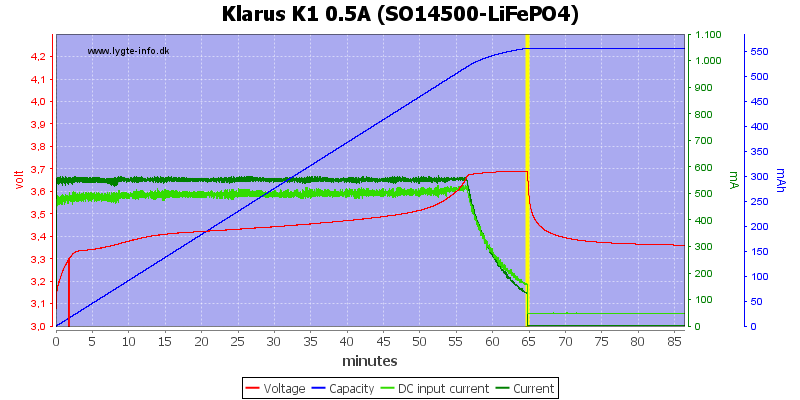 The 0.5A setting will not use a lower termination current. 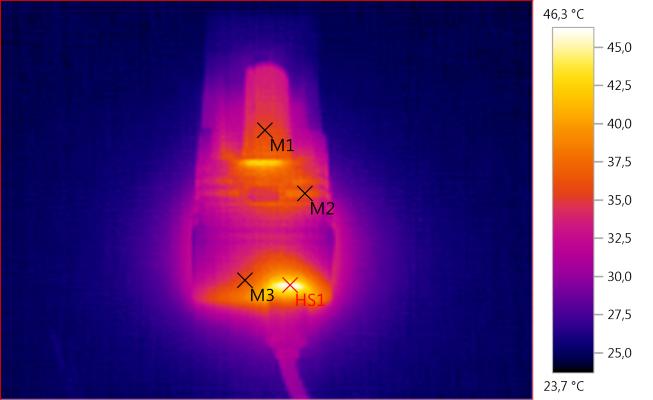 The smaller cells is charged fine, but with a bit high termination current. 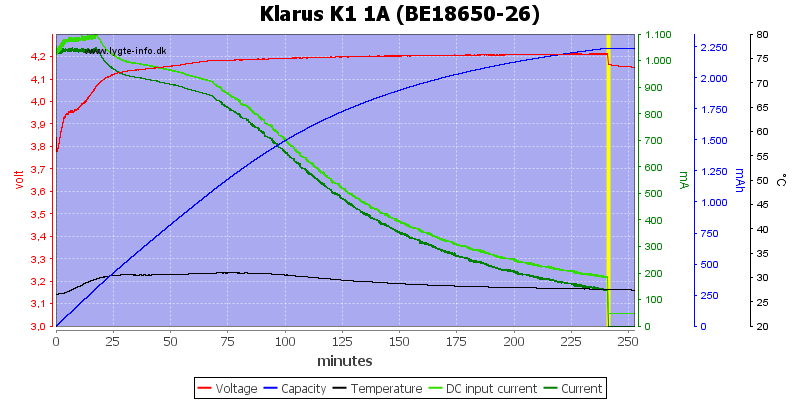 Adding a 0.5ohm resistor with the 5V usb power to simulate a long cable or weak power supply did not present any problem for the charger, but it takes longer time to charge. 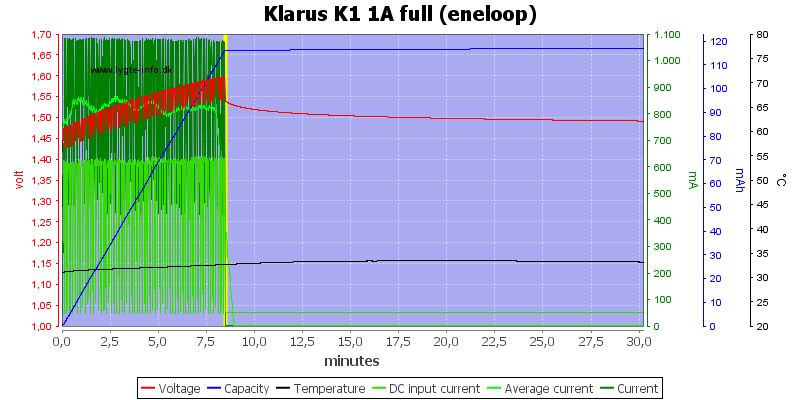 The battery stays fairly cool. 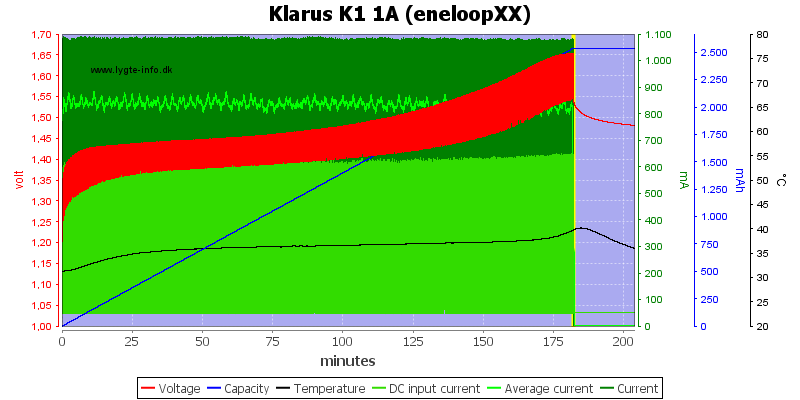 The charger need about 7 seconds to start, most of the time is for the user to select chemistry. 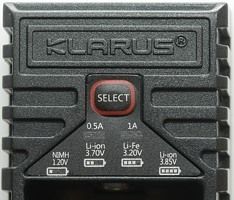 The charge current can be changed at any time by holding the button down for 2 seconds. This cell is getting old and termination must be on voltage, but it was terminated at the correct time as can be seen on the temperature track. 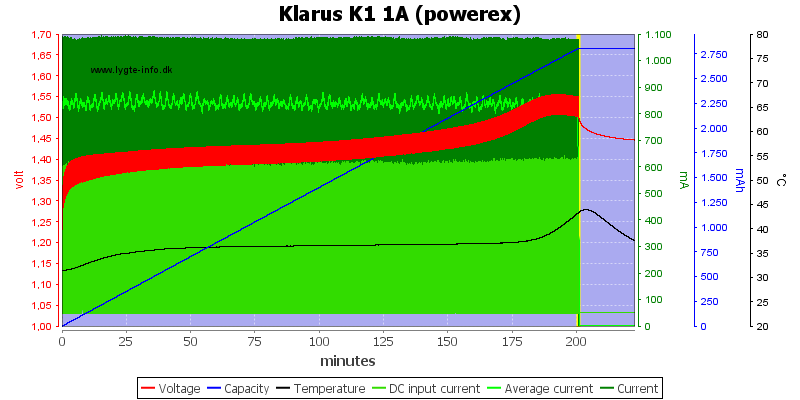 The two other high capacity cells was termination on -dv/dt. Even at 0.5A it can terminate correctly for a AA cell. 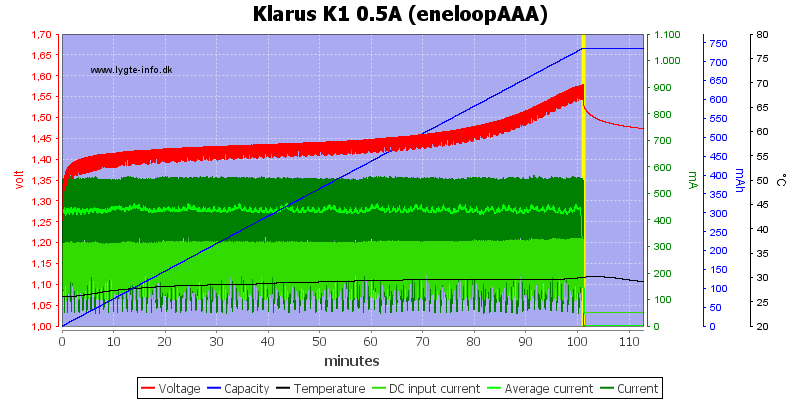 With the AAA cell it used voltage termination and maybe a bit early, but not much as can be seen on the temperature track (Temperature did increase slightly). 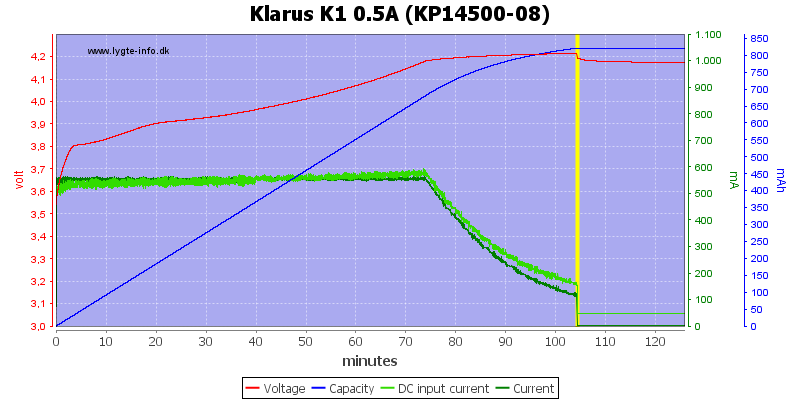 Detection of a full cell is faster than many -dv/dt chargers and it looks like it is done on voltage. 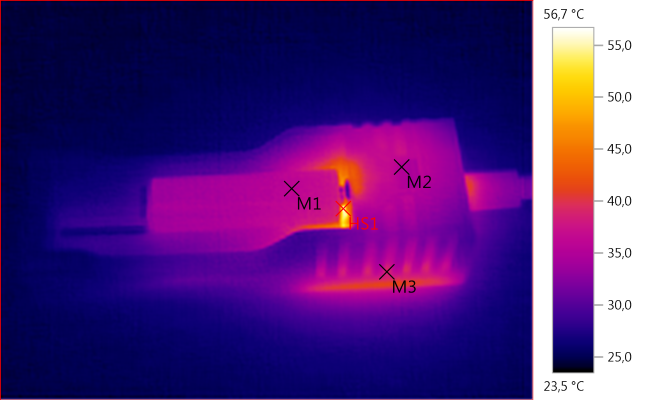 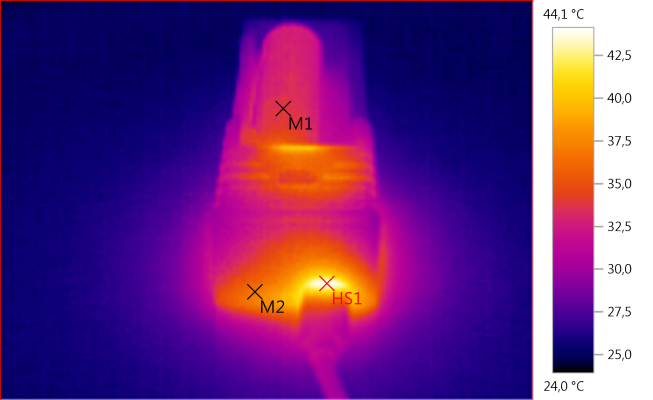 The IR camera locates some warm electronic part in the charger, but the cell is not really warm. 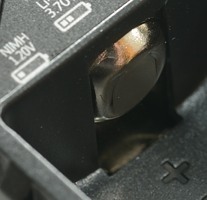 It is not possible to select chemistry when charging NiMH batteries, but the charger will also wait about 7 seconds here. 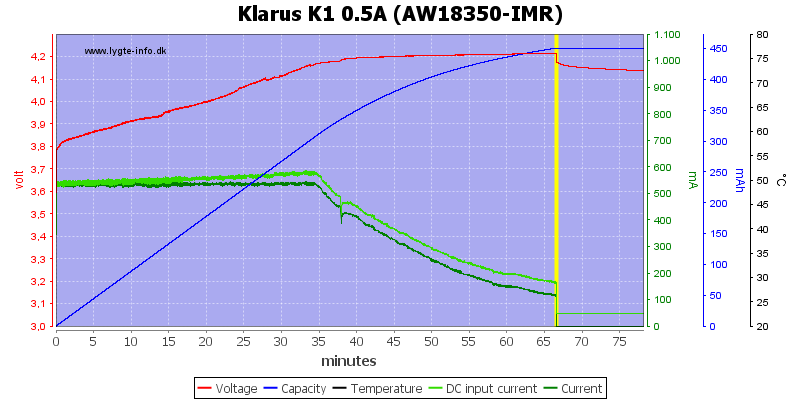 The charger measure voltage with current off. 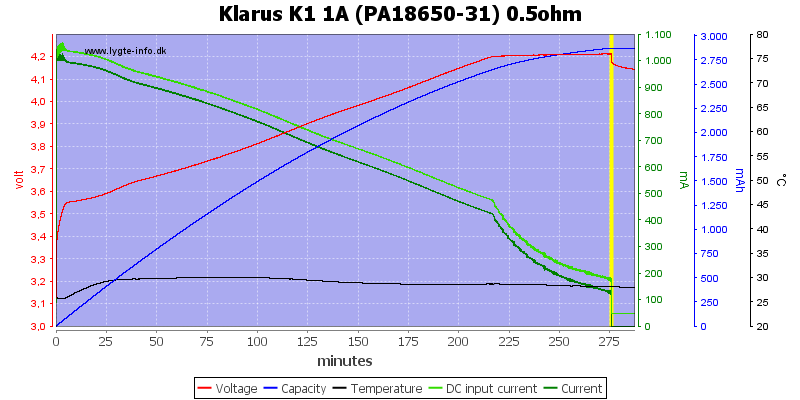 The charger works fine with 3 types of LiIon and NiMH, the only minor complain is the high termination current at 0.5A charging, this means smaller LiIon cells will be slightly below full charge. 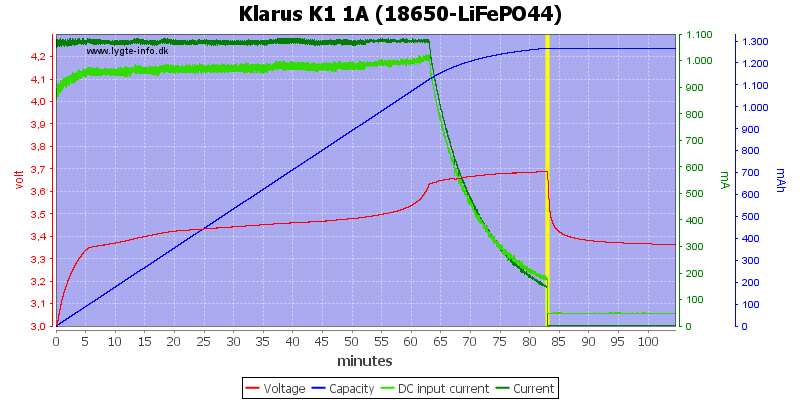 This makes it a good charger for both LiIon and NiMH.